Michelle Shocked Tapes Mouth, Stages Protest Outside Canceled Venue - Joe.My.God. 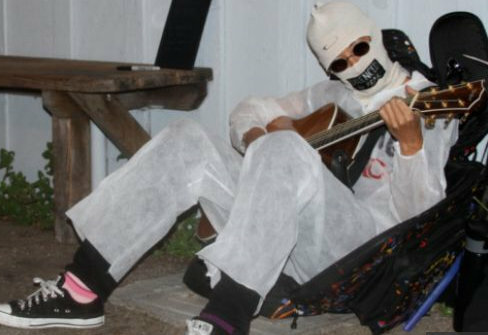 Face covered and mouth taped shut, alternative folk and rock singer Michelle Shocked staged a sit in outside a Santa Cruz nightclub that canceled her show because she made an anti-gay slur at a San Francisco club earlier this month. The tape across her mouth said “Silenced By Fear.” When asked a question, Shocked shook her head vigorously and strummed her guitar while seated on the ground outside popular music venue Moe’s Alley. She pointed to a sign inviting people to pick up a Sharpie marker and write on the white disposable safety suit she was wearing.